You'll find "Love Hotels" all over Japan, places designed for folks to shack up and get it on. The rooms offer a fantasy of luxury and escape from crowded tiny apartments where families or neighbors might spy on licit or illicit physical pleasures. You can tell the love hotels by their bright-lit neon signs with funny names, often English inflected: Hotel Elmer, Hotel Carrot, Hotel Charm, Hotel Princess, Hotel Chrystal. And the signs out front will list two or three prices: short stays, long stays, overnight stays. In the lobby, you won't see any people. Only a large room menu on the wall. If a photo of a room is lit up, the room is available. You like that room, press a button next to the photo. A faceless person behind dark glass hands you a key after you hand them your cash. While they might seem to be somewhat sordid for a foreign visitor, in Japan they are only somewhat perverted; mostly "futsuu" - normal, a fact of life for high school students on up to older middle aged folks, all wanting some privacy in a country with tiny dwellings and still some rice-paper walls. The bulk of Love Hotel rooms are simply "nice;" the accentuative touches include bevelled edges, many mirrors, large TVs with Karaoke, big bathtubs, the Golf channel. But occasionally you'll find a hotel with a roman temple build around the bed. 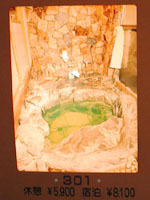 Or a bath and shower designed to resemble a mountain stream. Perhaps a circular bed under a functioning carousel. Fun lodgings! Adding kitch fantasy to utility pleasure quarters. After a few nights in expensive tiny business hotel rooms, staying overnight in a Love Hotel made financial and experiential sense. I had lived in a neighborhood dense with Love Hotels, Uguisudani in Tokyo, but I always had a Mansion to call home. So in February 2002 when I needed some cheap short term lodging I went looking in my old 'hood. From the April 2000 issue of Tokyo Journal: Between a Rock and a Soft Place by Andreas Stuhlmann is a good Love Hotel overview with some juicy details, an interview, some pictures and some good research. 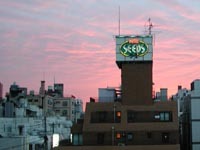 A page for soccer fans offers some analysis and history of Love Hotels. You can see a fun Love Hotel in the excellent movie "A Taxing Woman." There's a book about Love Hotels called Satellite of Love, by Alfred Birnbaum amongst other people. Filled with marvellous pictures of fantastical Love Hotel rooms, and little text or commentary. It might be hard to find, Amazon Japan has it, the Giant Robot book store used to. 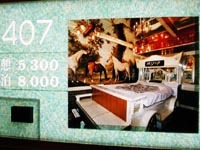 Columbia University Graduate School of Architecture, Planning and Preservation hosts the book's opening essay, "The Lost Dreams of Love Hotels."